That bear is so realistic! I just want to squeeze him...Aww! Oh, my!!! What an array!! The delicate green of the three-tier, with the demure hat shading the face, leading down to the lovely Victorian blouse cascading over the tiny waist, and the skirt, with JUST ENOUGH petticoat peeping out to kindle a gentleman's interest---perfect. As I was looking at these gorgeous cakes, my toddler ran up just in time to see the last one. I told him it was a cake. He said "Where's cake?" When I pointed, he said "That's not a cake, that's a teddy bear!" Great job! It fooled my little one, who is a great lover of teddy bears. I love that teddy bear. Perfect. All of the cakes are gorgeous!But Lisa Douglas's bear cake is so sweet! But I can just hear the screams from the child who's cake it is when it came time to cut it up: "Don't cut up my Teddy!" Too cute to eat! I think that first cake is my favoritest sunday sweet ever! I <3 it so very, very much! I loooveee Vanessa's second cake! And the teddy bear awwwww. Oh I love Sunday Sweets! I juste fell in love with the first two cakes ,actually i'm thinking to get married and arrange a wedding just to match those cakes (Ok first i need a boyfriend,AND to move to the US but i won't get stopped by unsignifiant details^^). And teh teddy bear of course, I don't think i would be able to cut through it! I'm sorry but I just don't see why you make such a fuss over these fondant cakes. The lace, the butterfly, and the flowers are all made by pressing fondant into a mold. Yes, it does take a little skill to do it right, but nowhere near the amount of skill it takes to pipe stringwork or frost smooth buttercream or to make a flower or buttefly or lace with a bag of frosting and the movement of your hand. Remember in the '80s when everyone was painting ivy and flowers on their walls with the use of stencils? It could be done well or sloppy, just like fondant. Praising people who are good at pressing fondant into molds is like praising people who are good at painting with stencils while ignoring the true artists who can do it (and do it better) freehand. Wow. That steel-blue and white wedding cake with all the multiple levels is just really spiffy. I'm impressed. The dragon is darling, but the teddy bear should be forbidden. How can anyone eat a cake like that?!!! I would feel so guilty cutting into anything that looked like it wanted to be my friend. so sweet. this made my morning (er...afternoon:) keep up the good work. This sight is always a bright spot in my day. 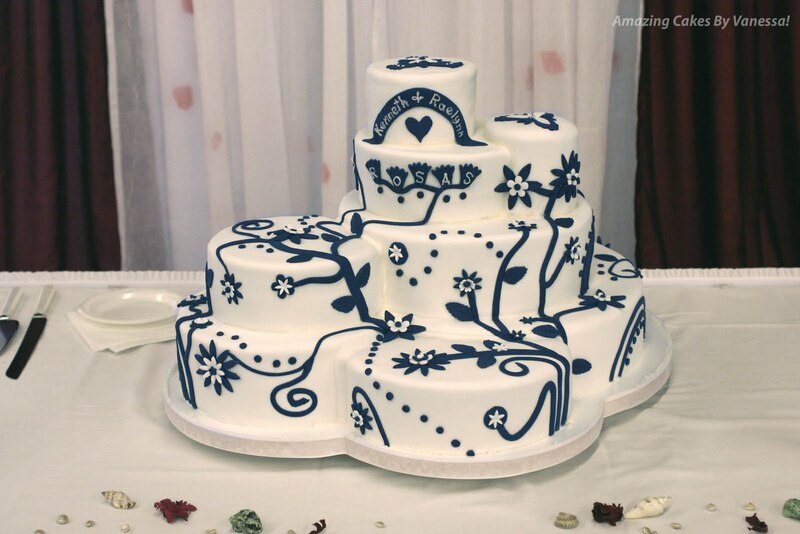 I love the first cake! So girly and perfect! I could stare at it all day! 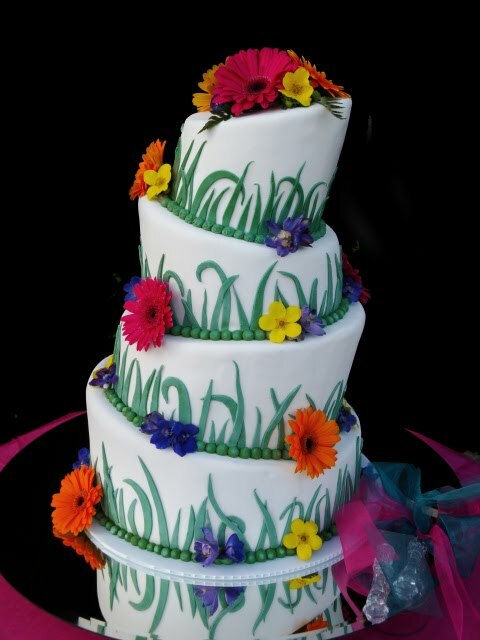 wow... all i have to say is you have NEVER worked with fondant. it is the most cantankerous substance in the world. it is highly affected by humidity and very prone to sticking to everything and shows even the slightest imperfections in your cake. it isn't just that they are pressing a cutter into the fondant and arranging the pieces together. the bakers of these cakes have to consider every variable from air temp to counter and hand temp to the order they mix batches of colors. they constantly are cleaning and re starching their surfaces to prevent stray crumbs from ruining a batch of fondant. and fondant is not cheap to make. plus, it can dry out very quickly. my husband and i tried to work with both fondant and marzipan in our catering business and we both decided it was not for us. my husband can make almost anything out of edible materials but we are just too out of practice.these bakers work with this stuff all the time. yes, they use stencils and / or molds to help then save some time but you never see all the batches that get thrown out because they didn't work. please, think just a little more before you start degrading someone else's lively hood. it may look easy but it takes a lot of work. See? You CAN make a brown bear cake that doesn't look like a mound of poo! Beautiful! Who do people think it's good to put "You did it!" on a graduation cake? Did you think I wouldn't? Thanks for the vote of confidence! I want that black and white beauty! WANT IT! And the blue flower cupcake...unless that counts has having your cake and eating it, too? I love that dragon and castle cake. Those little monsters were adorable. Oh my gosh, that graduation would have been perfect for my brother's graduation party, and it's even done in the right colors!!! Wowza. How on earth did they get the bear so fluffy looking? 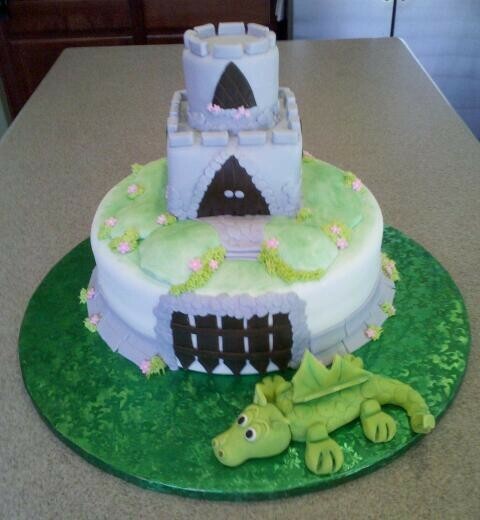 And that castle with the moat and the dragon? Eeeep. Sah-WEET! I find that similar (and as silly) to the painting v. photography arguments. Did I take the troll bait? I apologize if I did. Hey I came across your blog and I was surprised!! This is like Ace of Cakes only in a blog. That is so cool!! Both of Breanna's cakes are gorgeous--especially the pale green one. I love Breanna's style and color sense. She's better than anything you see on the television cake shows. lovely cakes.......totally unbelievable...but am I missing something? There are references in the comments about a green cake by breanne, I can only see two beautiful ones in pink and white...and the description @ racheld.... could be the same cake, since she also mentions a delicate green...sounds lovely, but how come i cannot see a demure victorian beauty??? i keep scrolling up and down todays entry!! I *LOVE* how the dragon wings are a leaf folded down the middle. Very woodsy and sweet (and I bet relatively simple). vw: proars- mixture between purr and roar, which is the sound I imagine this dragon makes- aw! My lil one (age 2) is big into hugging teddy bears...and I can just imagine him giving a big, squishy, "bear" hug to that last one! So adorable...and that blue and white one! 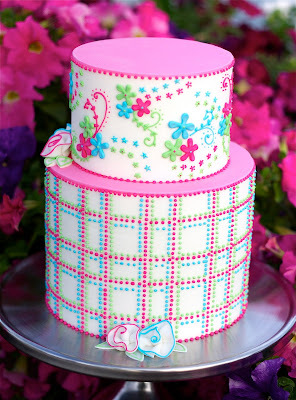 Never seen a cake stacked like that...plus so pretty! That graduation cake ROCKS!!! Vanessa, you did an amazing job. You are so talented. I made the first cake by covering it in fondant, and then all of the dots and flowers were done with Royal icing... and a Ziploc freezer bag. I didn't use any tips, just cut the tip off the bag. 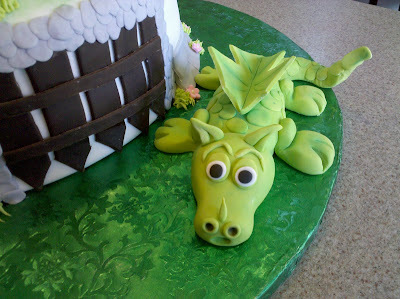 I am sorry if some people don't agree that fondant takes any skill, they are welcome to their opinions. However- those of us who work with it regularly know that it takes some skill and practice. I don't understand why people would ever say something mean about someone else's work! VK, the delicate green cake that racheld refers to is the second cake in the post. I guess it depends on the colour settings on your monitor, but I'm thinking it could appear anywhere between dark cream to pale green for different viewers. However, there is also a certain way of looking at it that racheld picked up on, that I had to look twice to see as well ... Just imagine the top tier is a head (covered by a hat with a rose on it), the bit between is the neck, the second tier is a torso with the waist below, and the bottom tier is a skirt, with the ankles hidden at the very bottom. *tilts head to one side* Got it? @anonymous, please post your name. It also can be interpreted as "you are done!!!" and don't have to go back to that h*** hole again ever! Woohoo!! Which is appreciated by many grads. Maybe they got a doctorate...surely worthy of a "you did it!" Wow. Those are freakin awesome. Mad props to those bakers. These are beautiful! Breanna is so talented, and I adore those cupcakes! That first one is AMAZING!!!! These are great! Ryley's garden tipsy cake is such a happy deseign. It's fun, and perfect. I really love the 1st one with all of the dots... looks like tedious work, but so lovely! Oh my goodness! I certainly didn't say any of these cakes looked bad! They are all very beautiful and perfect examples of what fondant is supposed to look like. I was simply stating MY opinion that I believe it takes more skill to make intricate decorations with buttercream than it does with fondant, and yet fondant gets all the praise. FYI, I HAVE in fact worked with both fondant AND buttercream so I DO know what fondant is like and I take much more pride in my buttercream work because perfection is more difficult to achieve than with fondant. To say I was "degrading someone else's lively hood (sic)" is not only inaccurate but incredibly ironic considering the objective of this blog. All one has to do is look at the weekday posts here to see that "professionals" make horrid looking cakes in both fondant and buttercream, which is a testimony to how difficult they both are to work with. Once again, I just want to stress for the people who made these Sunday cakes that they are BEAUTIFUL and PERFECT examples of how fondant should be done, and I was in no way criticizing your work; I was simply wondering why people bow to fondant and ignore buttercream. 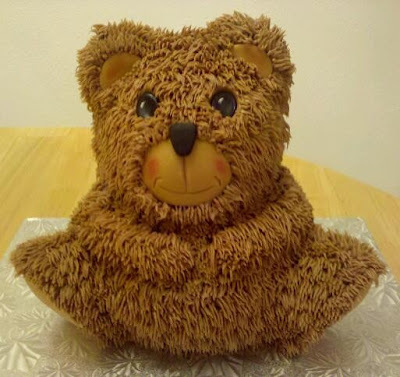 My daughter looked at the teddy cake, loved it, but then cried "but they'd cut its head off!" Thanks to everyone who complimented me on my cakes. I've been attending to family medical business in California for a week and have been unable to post since the hotel computer wouldn't show the word verification image (evil thing...). The bride wanted it simpler than the original photo, and it was a lot of fun to make. Took 47 eggs and weighed 64 pounds when finished! 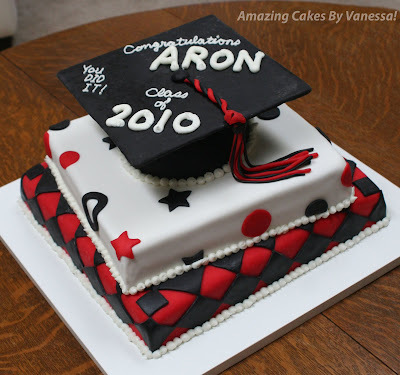 The graduation cake was for the eldest son of a good friend, and was made to match the school colors. It turned out just the way she wanted it, and was quickly devoured by family and friends. It's funny how ephemeral cakes are. 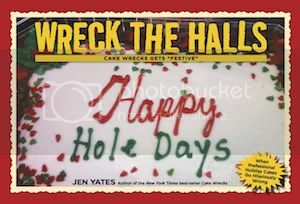 I enjoyed making cake for the book signing, and was honored to see my cakes featured on Sunday Sweets. Thanks, John and Jen! It's nice to see some beautiful cakes! Amazing talent! I really want to hug that cute little bear! 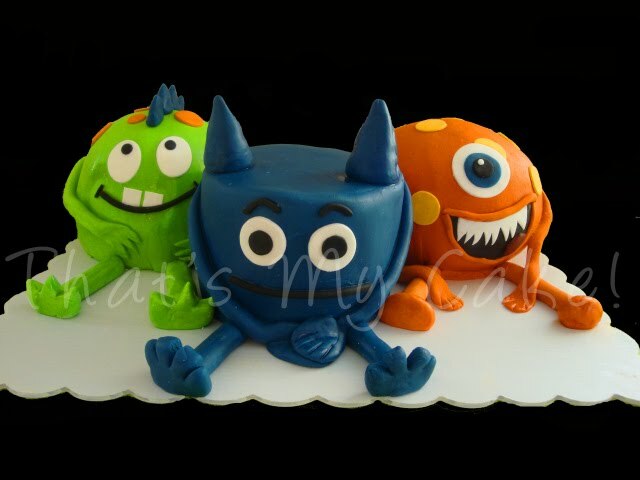 The monsters look like the characters from a popular preschool TV show - Yo Gaba Gaba. Am I right?